set aside noting in default. When the Defendant(s) fail to file the Defence within the time, the Plaintiff could file noting in default. Once the Plaintiff file the noting in default; the Defendant(s) must bring a motion to set aside the default judgment for filing the Defence. permission to file a Defence. Upon successfully arguing for set aside the noting in default; Defendant(s) must ask for the Court’s leave to file the Defence. This Motion can be heard at the same time as set aside noting in default. permission to file a Defendant’s Claim. 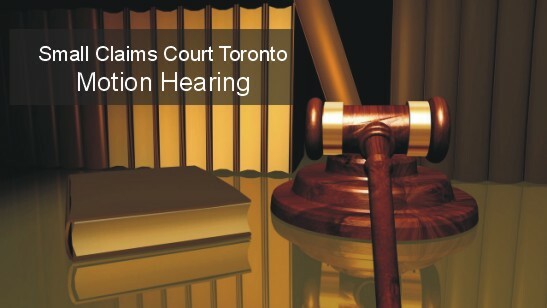 The Defendant(s) is permitted to bring their own claim within twenty days after filing the Defence for the Plaintiff Claim. However; should the Defendant fail to file the Defendant’s Claim within twenty days, then, the Defendant must bring a Motion asking for Court’s leave for filing Defendant’s Claim. set aside order dismissing claim as abandoned. In the event of a Plaintiff Claim without any progress beyond a reasonable time, the Defendant may try to dismiss the Plaintiff Claim by bringing a Motion. terminate garnishment and/or withdraw writ(s). The Debtor may bring a motion to request the Honorable Court to Terminate Garnishment for a justifiable reason. Other: There are other instances for filing Motion, such as asking for the Court’s Order for the Defendant comply with previous order.